The kidneys are vital organs that assist with everyday function. There job is to filter waste products and excess water out of the bloodstream and flush it out of the body as urine. The kidneys also help to maintain a healthy hydration level and balance of minerals within the body. There are many disorders that can lead to kidney damage. Ingestion of certain plants, anti-freeze exposure, and some human medications can all cause acute (fast acting) kidney failure. Many of our senior pets will develop chronic kidney failure - a slowly progressive wearing down of kidney function. 1 in 3 senior cats and 1 in 10 senior dogs will develop kidney disease. The kidneys are essentially filters through which the blood blows for cleansing. When disease or again causes the filtration process to become inefficient and ineffective, blood flow to the kidneys increases in an attempt to increase filtration. This results in the production of more urine. To keep from becoming dehydrated due to increased fluid loss in the urine, the cat has to drink excessively. As the disease progresses, waste products that would normally be filtered out of the blood remain behind. Early stages of kidney disease include: excessive urination, increased thirst, and lethargy. Advanced stage symptoms may involve: loss of appetite, weight loss, vomiting, diarrhea, bad breath (from toxin buildup), back pain, and ulcerations within the mouth. Kidney disease is diagnosed by evaluating a blood sample for the level of two waste products in the blood: the blood urea nitrogen (BUN) and blood creatinine. 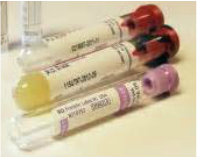 A urine sample is also used to assess the degree of kidney disease. Urine is evaluated for concentration, protein level, and the presence of infection or abnormal cells. It is highly recommended that all pets over the age of seven be screened for kidney disease once a year. Large changes in kidney bloodwork may not be evident until two thirds of the kidney function is lost, so even minor changes should be taken seriously. Early detection is vital for meaningful treatment. Once the kidneys are damaged; they will never be 100% normal again. Having said that, many pets still have enough functional kidney tissue so that treatment can be rewarding. The goal of treatment is to keep the kidneys functioning as long as possible in order to maintain a good quality of life for your pet. Therapy revolves around recovering and maintaining normal hydration level. Large quantities of fluids are given to "flush out" the kidneys and return function to the cells if possible. Fluids also help provide electrolytes such as potassium. Depending on the severity of the disease at diagnosis, initial fluids may be given intravenously during a hospital stay. Otherwise, fluids may be initiated on an out-patient basis and many pet owners can be taught how to provide these fluids at home. Another valuable tool for treating kidney disease is dietary therapy. Your veterinarian can recommend a prescription diet that can help extend your pet's life. These diets are low in protein, low in phosphorus, and non acidifying. Typically, these diets are available in dry kibble and canned formulations (canned formulas have added water and can help with hydration). Be aware that providing your pet with other table food, treats, or "extras" will counteract the value of the prescription diet. Examples of prescription kidney diets include: Hills Prescription Diet K/d, Purina Veterinary Diet NF, and Royal Canin Renal Veterinary Diet. There is no over-the-counter diet that is equivalent to these diets. Other therapies may be beneficial; these include: potassium supplements, phosphorus binders, anti-nausea medication, blood pressure regulators, or stomach acid reducers.